The Isle of Tiree has a rich and varied history, some of which is still in evidence today. The earliest mention of Tiree on record was in an Irish account of the Picts which states that they landed in Leinster then sailed northwards and landed on "Tiree beyond Islay". Mentioned in a poem c.200 B.C. In the description of the exploits of Labraid Loingsech, it was said eight towers were destroyed in Tiree, "ort ocht turu Tiri lath", one can only assume that these were the Pictish Brochs which dotted the coastline of the Island; the remnants of some can still be seen today. Evidence of the Norse occupation of the Island which lasted on and off for approximately 400 years, is evident in many of the Township names of today.1266 saw the Norse invaders leave the Island after the defeat of Haco at Largs, control of the Island then being adopted by MacDonald of the Isles. In the middle of the 12th Century, Somerled gained control only to be deposed by the MacDonalds again in 1494. 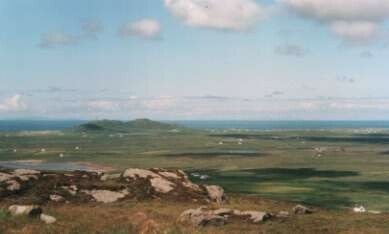 Possession changed when Tiree was gifted to Lachlan MacLean of Duart in 1517. The Island remained theoretically but not legally under the possession of the MacLeans, despite skirmishes and invasions, until 1674 when it came into the possession of the Campbells of Argyll, who retain ownership into the present day. 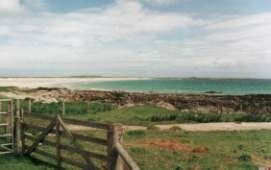 The Isle of Tiree is part of the archipelago known as the Inner Hebrides, with Coll it's nearest neighbour and Mull, within view, obscuring Tiree from the sight of mainland Scotland. The geographical location of the Island has, throughout history, made it an excellent base of operations; from the Picts, a seafaring race who used it as a base to swoop down on the Irish and mainland Scottish coasts, to the present day where the Civil Aviation Authority use the information gathered from the "Golf Ball" which dominates the Island, for guiding aircraft flight paths to Gatwick. 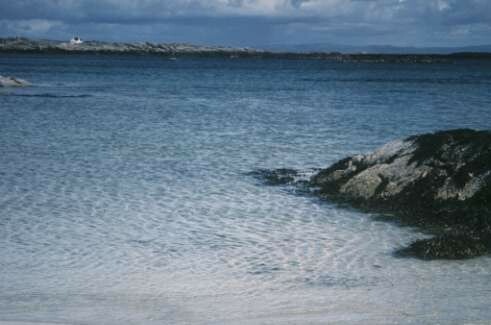 Placed in the Gulf Stream, Tiree has an agreeable climate and warm coastal waters. Rarely experiencing snow or freezing temperatures, Tiree is known as the "Sunshine Island of the North" and as such is mentioned in the Guinness Book of Records. To look around the townships of Tiree and to read some of their history press the buttons below or take the whistlestop tour by following the arrows.